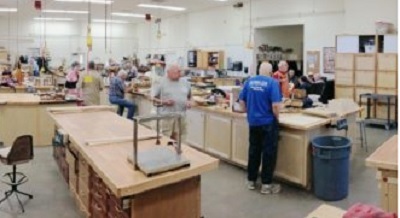 Located in the Kuentz Recreation Center in Sun City West, the club building has over 6,000 square feet filled with state-of-the-art woodworking power equipment and hand tools. The Sun City West Wood Club was established in 1979. For a review of our wood club please read the Fine Woodworking Magazine editorial. Visitors and new members are welcome. Stop by the wood shop to sign up for a tour or new member orientation. New member orientation is scheduled at the beginning of each month. Hands-on tutorials are offered at regular intervals. Like all clubs in Sun City West, the wood club is both a craft club and a social club. The club holds picnics, a Christmas party, and club open house events. the club membership participates in the Sun City West craft fair where members can sell their work.The Club wood shop is open Monday thru Saturday from 8-4, hours are extended to 8 PM on Wednesday, and Sunday 12-4 PM. Check out our Facebook page under “SCW Woodworking Club” Click for Facebook page.